Last Chance to Believe In a Republican-Assisted Carbon Tax? The biennial “Scalise Resolution” condemning carbon taxing is up for a vote in the House this week, according to a report on The Hill news site. The first assertion ignores the possibility of carbon-dividend proposals that would benefit most low-income households by returning more carbon revenues in monthly payouts than they would take away in higher fuel prices. The second ignores the need of U.S. industry to heed the accelerating transformation of global energy markets to low- and no-carbon tech like wind turbines, solar cells and efficient vehicles and appliances. 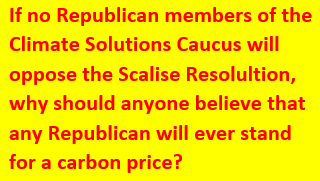 The resolutions’s other thirteen “whereas’s” are equally vapid, and in fact the Scalise Resolution is just the Republican Party trying to use carbon taxing to beat up Democrats. Nevertheless, the upcoming vote can be seen as a crucial test not just for the Climate Solutions Caucus but for the very idea of a Republican-backed or -assisted carbon tax. The caucus now has 43 House Republican members. By joining, each took a pledge to “explore policy options that address the impacts, causes, and challenges of our changing climate,” according to the page devoted to the caucus on the Web site of its sponsoring organization, Citizens’ Climate Lobby. It also has 43 Democratic members, per its “Noah’s Ark” approach to climate bipartisanship. We single out Republicans because in 2016, when a similar resolution passed by 237-163, not a single Republican voted No. Sixteen abstained, while six Democrats joined the 231 Republicans to vote in favor. In the past, House G.O.P. members and their apologists have cited “primary anxiety” — fear of being ousted in a party primary by even harder-right insurgents — as reason to toe their party’s denialist line on virtually anything bearing on climate. But this year’s primaries are now in the rear-view mirror. Any Republican member’s vote against the Scalise Resolution this week would appear to carry no political cost until at least 2020. And by then, climate denial could have become untenable in most House districts, even red ones. 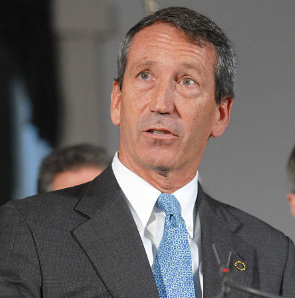 Climate Solutions Caucus member Mark Sanford (R-SC) lost his primary last month. A vote against Scalise could give him a climate “profile in courage.” Pic credit: Getty Images. Even less peril awaits the ten Republican caucus members whose current term in Congress is their last. Nine have announced their retirement: Bud Shuster (PA), Charlie Dent (PA), Darrell Issa (CA), Dave Reichert (WA), David Trott (MI), Ed Royce (CA), Ilenaa Ros-Lehtinen (FL), Lynn Jenkins (KS), Ryan Costello (PA). A tenth, Mark Sanford (SC) lost his primary last month. Just a single vote opposing Scalise would end the carbon-tax embargo by which no sitting Republican congressmember or senator has ever endorsed carbon pricing, even just in principle, since 2010. It could signal, in some small way, that at some not-far-off time, a critical mass of Republicans might vote for a carbon tax. Which in turn could validate organizing for revenue-neutral carbon taxing like the Citizens’ Climate Lobby’s fee-and-dividend proposal. CCL is rallying its membership to defeat the Scalise Resolution. But my sources say that CCL leadership aren’t focusing their organizing to target Republican caucus-members. That might have been understandable two years ago, when the caucus was in its infancy. But it’s now midway through its third year. It’s fair to demand that Republican members of the Climate Solutions Caucus to stand up and oppose the Scalise Resolution. If they won’t, why should anyone believe that any Republican will ever stand for a carbon price? Prominent climate journalists including David Roberts and Kate Aronoff have dismissed the caucus as greenwash for denialists. It may be too much to ask all 43 of its G.O.P. members to form a No bloc on Scalise. But the ten who are retiring at year’s end could take a stand, and perhaps pull in a few Republican holdovers. As we suggested last month, that could provide political validation for carbon fee-and-dividend and its close cousin, the Climate Leadership Council’s carbon dividends plan. We at CTC aren’t holding our breath. But we’d love to be proven wrong. July 19 addendum: Four G.O.P. caucus members — Ros-Lehtinen, Fitzpatrick, Love and Curbelo, whose carbon-tax bill is expected to drop next week — voted against the resolution today, as Inside Climate News reported. Two non-caucus Republicans joined them, for a total of six.